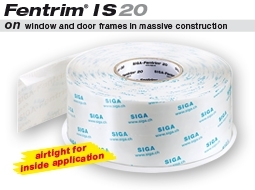 The white coloured, single-sided high-performance adhesive tape Fentrim 20 is the optimal solution for permanent airtight bonding of window and door frames in solid construction from the inside. Fentrim 20 is pre-folded and available in the sizes 15/85, 15/135 and 15/185 mm. According to the rule "less permeable on the inside than on the outside", the black coloured window-joint tape Fentrim 2 perfectly supplements Fentrim 20.